LE ROUGE -Gibraltar. . . / Plan du port et ville de Mahon.. LE ROUGE, G.L. - Gibraltar. . . / Plan du port et ville de Mahon..
Gibraltar. . . / Plan du port et ville de Mahon.. - LE ROUGE, G.L. Map maker : LE ROUGE, G.L.. Size : 18.7 x 26.0 inches. / 47.6 x 66.0 cm. Description :Folding-map with four maps on one sheet. 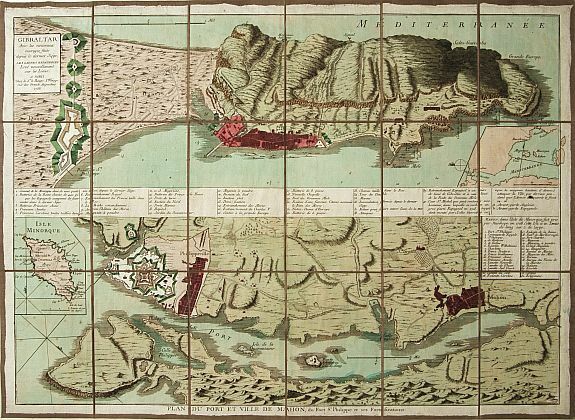 Two accurate maps showing Gibraltar in top with a key (1-40, a & b) and map of the fort and town St.Philippe and port Mahon with a key (1-32). Port Mahon is one of the world's finest natural harbors and provided together with Gibraltar, particularly strategically importance during the eighteenth century wars between the English and French Navies in the Mediterranean. Checklist of Charts of Mahon Harbour, mapforum 43. Condition : A folding map, contemp. laid down on linen. Very good impression.